When you’re running before dawn or after dark it’s important to stay safe and be seen. While all of our running gear is super sparkly, especially when the light catches it, making it the perfect choice to wear while running in the dark; our reflective running skirt was actually designed with YOUR safety in mind. The chevron “pattern” is actually a reflective ink, which will ensure that you can, and will be seen from all angles. Plus, it’s super soft, chafe-free, and incredibly comfortable to wear. Paired a “safety” orange visor, some sparkly sleeves, and a pair of really colorful race legs, you’ve got an outfit that’s sure to stand out – even in the dark. 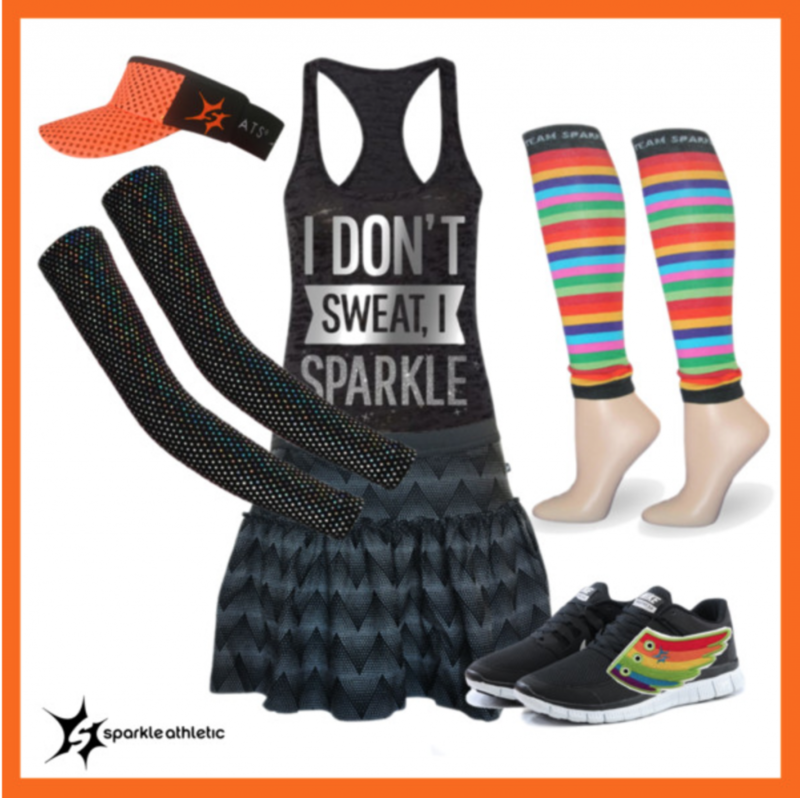 Get everything you need for your Reflective Running Costume here. Assembling the reflective running costume is pretty self-explanatory… but once you’re dressed, voilÃ ! Who says you have to forego fashion for safety? We think the two go hand in hand. The only question is where are YOU going to wear this reflective running skirt? We think it’s perfect for any nighttime run or race (for example the Las Vegas Rock ‘n Roll or Ragnar). For even more costumes for running ideas, check out our entire running costume guide.